Paella (pronounced pah-A-ya, NOT pie-ELLA) is one of those dishes that brings people together and is fantastic for large gatherings. Of course at VictorsFood we are all about bonding over food, so this is a hit for our cooking team building events. Also it’s a great dish to show off in our cooking classes (like the one coming up on 1 November). This dish needs some special equipment to make sure it comes out well. The large, shallow, flat paella pan is essential, as is a large burner that the pan sits on so the flame is all around the pan. Some will tell you that you can do it in a sauté pan, but that’s just not going to come out well as the heat is too concentrated in the pan. While the Portuguese and Spanish battle it out over who created paella, most people seem to credit it was first made famous in Valencia, Spain. 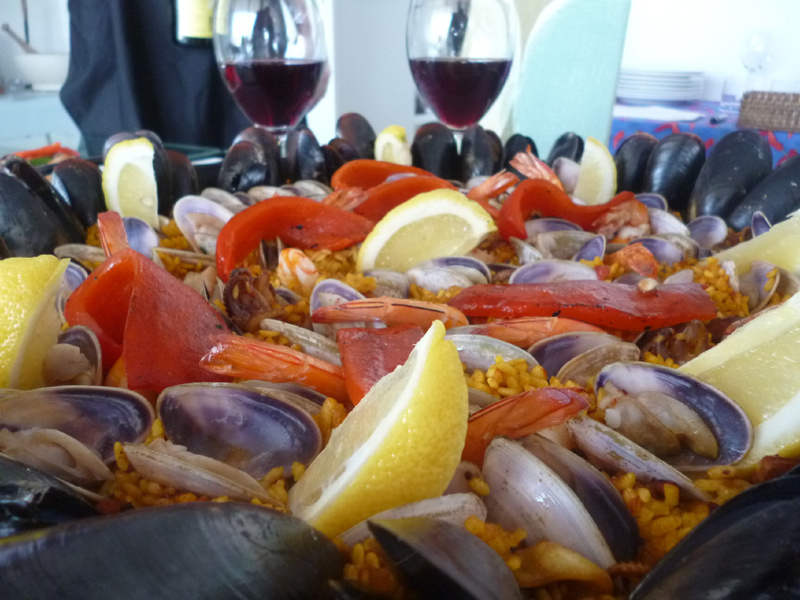 There are now many variations of paella, including seafood, rabbit, various meats and even vegetarian. The important components are the rice, saffron and stock. Paella uses either bomba or calasparra rice and is always finished with saffron and an enriched stock. The stock must be boiling when you add it to the rice, a little at a time. Do not under any circumstances believe anyone who tells you that saffron is just expensive colouring and that yellow cake colouring is just as good. They obviously have no taste buds. For technique, remember paella is not risotto, so no stirring once it starts to cook. The big key about paella is trying to actually get the bottom layer to burn a wee bit, creating a lovely crust which we call the “truffles of Spain”. Imagine tasting those crunch morsels now with the essence of smoked paprika, saffron and a glass of Pinot to back it up! Give this recipe a go and let me know how it comes out. If you’re not quite ready to tackle it on your own, come to our class! Heat stock in a saucepan, over a low heat and add the saffron. Heat oil in a paella pan, lightly sauté the whole prawns and remove. In the same oil, sauté the octopus till sealed, then remove. Add extra oil to the pan and stir in onion, garlic, chorizo and smoked paprika, sauté till tender. Add tomatoes and cook for another 3 minutes. Add the rice and mix well until the rice is evenly coated, season with salt. Spread the rice evenly over the pan. Pour in enough stock to just cover the contents. Cook over medium heat so rice is bubbling gently. As the rice absorbs the stock keep pouring more on top as this is how the rice cooks. Do no stir. Cook paella over low to medium heat for 30-40 minutes till the rice is just about done; about 5 minutes before the rice is fully cooked. Arrange capsicums and peas on top of the paella. Add the mussels, vongole and whole prawns. Cover the pan with aluminium foil to steam open the mussels and vongole. Uncover the paella and let stand for 5 minutes before serving. Garnish with lemon wedges.